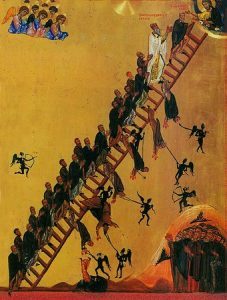 The Ladder of Divine Ascent by St. John Climacus (St. John of the Ladder) is a practical, down-to-earth treatise on the struggle for the Christian life. 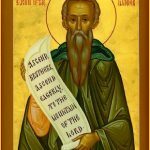 Often read during Great Lent, it contains detailed advice about acquiring the virtues—and avoiding the deadly spiritual pitfalls along the way. The book is divided into 30 short chapters (“steps”). Each chapter consists of numbered paragraphs. To provide a sense of St. John’s clear and readable style, below are several paragraphs from Step 22: On the Many Forms of Vainglory. The entire book is available as a pdf file. 31. He who is proud of his natural advantages, I mean cleverness, ability to learn, skill in reading, a clear pronunciation, quick understanding and all such gifts received by us without labour, will never obtain the supernatural blessings, because he who is unfaithful in a little is also unfaithful and vainglorious in much. 41. When we invite glory, or when it comes to us from others uninvited, or when out of vainglory we decide upon a certain course of action, we should remember our mourning and should think of the holy fear with which we stood before God in solitary prayer; and in this way we shall certainly put shameless vainglory out of countenance—if we are really concerned to attain true prayer. If this is insufficient, then let us briefly recollect our death. And if this is also ineffective, at least let us fear the shame that follows honor. For he who exalts himself will be humbled not only there, but certainly here as well.